SO! I opened my Actors’ Equity Association’s monthly newspaper today. A few times a year, they list members who have passed away. There were many names and “names” listed this session: luminaries such as Lauren Bacall, Polly Bergen, James Garner, Joan Rivers, Marian Seldes and Robin Williams. But at the very top of the litany of the famous was our own beloved, Terri Allen. I thought, even in death, it is SO appropriate she gets “top billing”. Nostalgia was abound at the DC Cabaret Network’s December Open Mic with a hello to Christmas and a fond goodbye to The Warehouse. Christmas decorations and holiday snacks greeted folks as they arrived to share some winter cheer. Host, Steven Cupo and the evening’s music director, Reenie Codelka, helped lead the spoken and musical reverie. The owners of The Warehouse, Molly Ruppert and family, came to help give a proper send-off, as the building is about to be razed for new mixed commercial use. As a surprise treat, Molly bought all the guests a round of drinks in honor of the Ruppert’s long mutual history with the Cabaret Network. That’s what you call Holiday Cheer! Molly wasn’t the only one with a tribute or two. The president of the board of the DCCN, George Fulginiti-Shakar gave thanks for the long-time relationship the Network has had with The Warehouse as its artistic home. In addition, actor/singer Michael Miyazaki re-wrote the lyrics to “Thanks for the Memory” to reflect DCCN’s residency there. His very clever lyrics and sweet reflection had everyone laughing and in tears. The evening came to a wonderful close as everyone gathered around the piano for the traditional December Open Mic singing of Christmas carols. Goodbye, The Warehouse. Goodbye, sweet Ruppert family. And hello Happy New Year and our NEW performance space … wherever that may be. But, never fear, the tradition will continue! We will keep you posted. 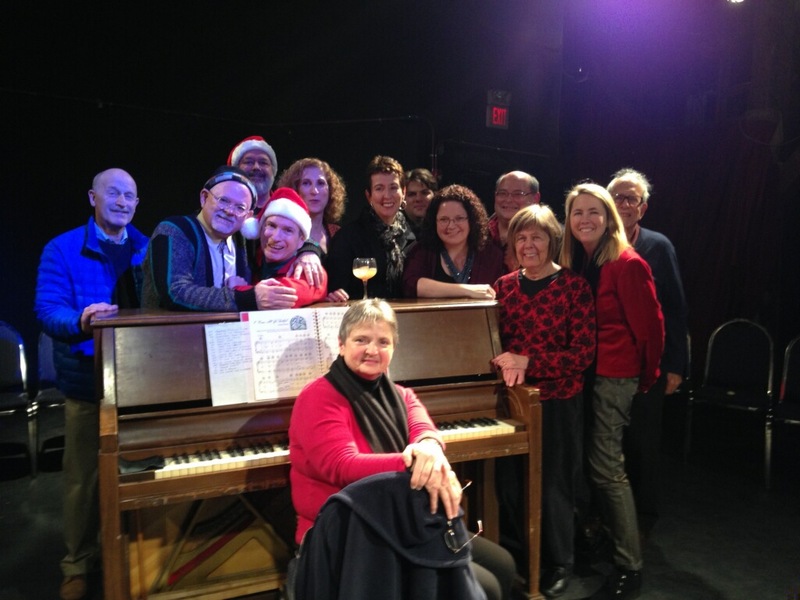 In the meantime, a Merry Christmas and Happy Holidays to everyone from the DC Cabaret Network! Mary Reilly – What Child is This?